Mazel Tov, you’ve made it through 7 nights of Chanukah without burning the house down. 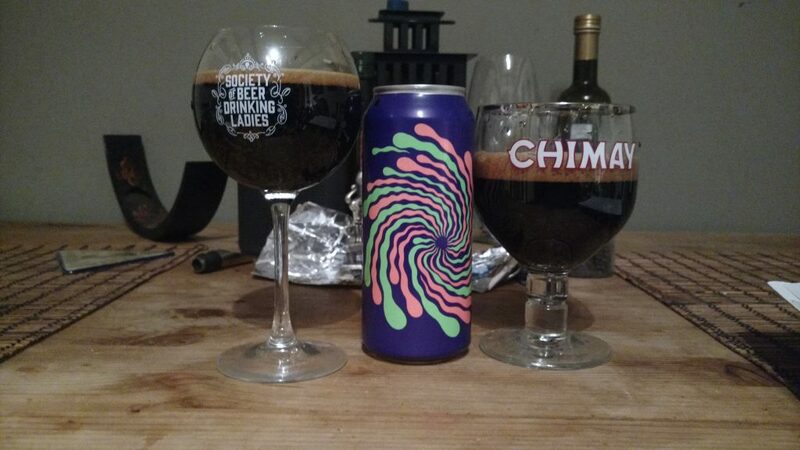 You deserve a reward – and that reward should be Omnipollo‘s boozy Prodromus, a super strong and delicious 10.5% ABV stout. Flavoured with graham crackers and chocolate chunk caramel bars, this is a dessert in a glass. A treat. You may even get your bubby drinking this one, even though she doesn’t like beer. Holy moly. Omnipollo originated in Stockholm, Sweden, and the brewers travel the globe brewing deliciousness with their brewing friends. Brunswick Bierworks brews up this special concoction at their East York facility. I was lured in by the trippy packaging, and a manageable price tag of $5.95 for a 473 ml can at the LCBO. They had this one in stock at our tiny LCBO outpost at the Loblaw’s at St. Clair West station, which rather surprised me. The selection leaves a lot to be desired at this tiny store. We poured ourselves a chalice each, and toasted my mom turning 65 today. If she drank beer, she’d probably like this since it’s essentially chocolate in a glass. Appearance: Deep brown, bordering on black. Lasting dark brown frothy head that reminded me of chocolate mousse. Aroma: Milk chocolate, dark chocolate, melted chocolate ice cream, s’mores, bourbon, Madagascar vanilla bean. Taste: Silky, luxurious mouth feel, coating your palate with a thick feel. Tastes like rich dark chocolate, cocoa powder, and vanilla bean. Definite warming alcohol burn with vanilla and bourbon. Aftertaste: Distinct warming bourbon feel, with caramel on the aftertaste. This beer is almost chewy in texture, a luxurious treat. Food pairing: This is a winter warmer if I’ve ever seen one. Serve with chocolate pecan pie, cheesecake, or chocolate babka. Overall: A glorious stout. I may buy a few more to keep me warm during the holidays, and bring it to the in-laws to enjoy with dessert. This is not a weekday beer, but I chose to start off my Monday with it cause I throw all caution to the wind during Chanukah.